What’s the point of a pro-indy majority at Holyrood? Quite a lot has been written, and no doubt will continue to be written, about how best to achieve a pro-independence majority in the Scottish parliament. Should independentistas vote SNP on both the constituency and the regional votes? Or should they give their regional vote to one of the other pro indy parties – Greens, RISE, Solidarity? With the SNP still riding high in the polls, some argue that a regional vote for them will be wasted. So it would be better to vote tactically for one of the other pro indy parties. Others argue that tactical voting for the regional seats is just impossible. No one can really know in advance, and certainly not at this stage, just how well or poorly the SNP will actually do in the constituencies. I find most of this to-ing and fro-ing a tad irritating. Just for the record I will cast my regional vote for the Greens. Nor out of any attempt at tactical voting, but because I am convinced by (most) of the policies offered by the Greens. On the other hand if you prefer the SNP, you should vote SNP both times. What is missing from all of this is just why a pro indy majority in the parliament is so important? Again, to be clear, a pro-indy majority is important as only a pro indy majority can initiate another referendum. However is that all there is to it? Another referendum may be a necessary requirement for independence, but the main challenge in the meantime is to persuade as many of the 55% who voted No, to change their minds. Having a parliamentary majority to hold a referendum is not much use if we have not at the same time succeed in persuading a majority of the electorate to vote Yes. My concern is that none of the pro indy parties are coming up with ideas on how to move forward. What can the next Scottish parliament and government do to move the debate forward? I would suggest there are at least four key areas in which the parliament can take the lead – a constitution, the transition to independence, the economy and international recognition. An independent Scotland will need its own constitution. There is no reason why work on this cannot begin now. In Catalunya, their new parliament with its pro indy majority has established a study commission on a constitution. We could follow this line and set up a select committee of the parliament to prepare a draft constitution. An alternative would be to set up an independent Commission to develop a constitution. In both cases, an essential part of the remit would be to involve the public as actively as possible in the generation of the constitution. Any final decision would be taken by the parliament as a whole and then by the public in a referendum. The transition to independence following a Yes vote in a future referendum will involve significant legal changes and some intensive negotiations with Westminster over important matters such as the national debt etc. The White Paper for the referendum outlined the range of issues that would need to be resolved. However the White Paper, necessarily, was just the proposals of the SNP. 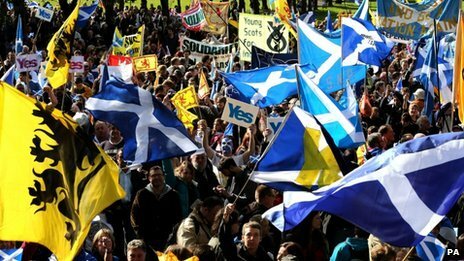 There is a broader pro indy movement, and it would be good to see all of this movement involved in discussing and preparing for a future transition to independence. Again this could be via a select committee or an independent Commission. The economy was by broad agreement the area were the YES movement made least progress. This covered worries about the affordability of pensions, the importance or not, of North Sea revenues and the currency issue. Too many voters were unconvinced by our arguments and were more inclined to be swayed by the assertions of doom coming from the No side. Before any second referendum we must have first convinced a clear majority of the soundness and long term stability of the Scottish economy. Work needs to begin now. And this work needs to involve as many people as possible. Parliament and the government need to establish how this work will be done and to oversee it. This will ensure the work has credibility. Much preliminary work has already begun, but it needs to be brought together in one process. International recognition was another area in which the YES side failed to convince a majority. Doubts about Scotland’s continuing membership of the EU in particular dominated much of the campaign. What I found most surprising was that the YES side had not managed to get any significant support from EU bodies nor from other member states. I find it hard to believe that everybody in the EU parliament or in all the governments and parliaments of other countries were adamantly opposed to Scottish independence. After all in 2006 all the EU member states, including Spain, recognised the independence of little Montenegro, after its independence referendum. Not only that but newly independent Montenegro was almost immediately accepted as a candidate for EU membership. Unanimously, which means that Spain also voted to accept Montenegro. It still seems incredible to me that we allowed to go unchallenged this notion that the EU would welcome Montenegro with open arms, but would reject Scotland. We need to find a way of establishing and maintaining formal and informal links with the EU parliament and the parliaments and governments of the other member states. The objective is to get at least some of the other states to publicly state that an independent Scotland would be welcomed within the EU. Similar links should also be established with other countries, especially with the USA and Commonwealth countries. It should not be too difficult to persuade the many countries that have become independent from Britain to support the wishes of the people of Scotland as expressed in a referendum. I am strongly of the view that the new parliament, if there is a pro indy majority, needs to quickly get moving and establish select committees, Commissions or whatever, to carry out the necessary preparatory work for establishing an independent Scotland. My central point is that we still have much work to do to convince No voters that Scotland has the resources to be a stable and successful country. I am disappointed that we did not do better on this score. I still feel that we should have done more about international comparisons. No two countries are the same, but Denmark and Scotland do have a lot in common in terms of geographic location, size and population. I am no economist and no expert on Denmark, but I find it impossible to work out just what natural advantages Denmark has over Scotland. Yet nobody, not even in the No campaign would suggest that Denmark is not one of the most successful countries in the world. Nobody ever suggests that Denmark should not be an independent country on the grounds that it is too small and too poor. So why did we not challenge Unionists to demonstrate with evidence why Scotland, unlike Denmark would not be similarly successful? The final result was a disappointment. There is though, no need to get too despondent. The opposite is indeed the case. We on the Yes side have much to be proud of and though we failed in our objective this time, there are many encouraging signs to be found in the campaign and the vote. Not everyone gets the chance to vote for independence. Just ask the Catalans! The referendum campaign inspired hundreds of thousands of Scots to get active, get involved and get better informed. This was shown in the voter registration and the high turnout. The Yes side contributed massively to this achievement. With 45% of the electorate on a very high turnout of 84% this is a massive step up for the pro independence movement. Considering where we started from, in the mid to high 30s this is great progress. The other gain is that many of these voters will remain activists in future campaigns. This is some more excellent news for the future. Only two age groups, the 18-24 year olds and the over 65s voted No. Unfortunately the 65+ group is both a very large group and a group that tends to get out and vote. This time 73% of them voted No. However not to put too fine a point on it, this group is not the future of Scotland. I am part of this age group and only too aware of this. If we can keep the other age groups on the Yes side the momentum is towards a majority for independence. This was one of the major themes throughout the campaign – women were much less likely to vote Yes than men. Much was made of this, but when push came to shove there was only a tiny difference – around 3%. Perhaps in the future we can put this one to bed. This is one of the stand out features of the results. The four council ares that return a majority for Yes are all predominantly working class areas – Glasgow, North Lanarkshire, West Dunbartonshire and my own Dundee. Well done to the fabulous four! However many other councils with large working class populations came very close to delivering a Yes majority. In Inverclyde for example the Yes vote was 49.92%, while North Ayrshire recorded 49% for Yes. Other councils where the Yes vote was above the 45% overall score included South Lanarkshire, Renfrew, Clackmannan, East Ayrshire, Falkirk, Highland and the Western Isles. Apart from the last two, all the others are predominantly working class areas. Much of the credit for the higher than average Yes votes in these councils must go to the work of RIC. Regular canvassing paid off in Yes votes. Though RIC initiated and pushed this part of the campaign, the success was not due just to RIC. The Greens, Socialist party, unattached individuals and let us not forget many members of the SNP, including MPs and MSPs also played their part. Difficult for Labour to try and deny this, the results in the councils mentioned above were a disaster for Labour. Large swathes of Labour voters have decided in favour of independence. They no longer trust Labour on many key issues, and the party will struggle to win these voters back. This is a constituency that the pro independence side must retain. Which can only be done with a clear left wing alternative. While the overall result is good and a new high for independence, the high Yes votes were not in the traditional SNP areas, with the exception of Dundee. Areas where the SNP have done well in Holyrood and local elections all voted No, often by quite large majorities. This will cause some consternation in the party. The SNP still seems to be most voters’ first choice as the government of a devolved parliament in large parts of the country, the North East for particular. However there is little sign that this success is translating into votes for independence. If we are to win independence the other non SNP voices will need to play a more prominent role. The last minute panicking by the Unionist parties has opened a veritable can of worms for the UK. Making solemn vows to the people of Scotland will soon come to be seen as the easy bit. Delivering anything worthwhile may prove not just difficult, but almost impossible, to quote the not much missed Senhor Barosso. With English MPs likely to say No to everything and the Welsh and Northern Irish governments wanting more, Unionists may come to regret winning the referendum. We on the other hand must keep holding them to account and exposing the contradictions at the heart of their vows. As the Catalan activist Maiol Sanaüja commented, either the UK becomes a real federation or it implodes. Let’s help it implode! Life is full of disappointments, so we must let this one hold us back. I hope most, if not all the wonderful pro independence campaigning groups keep going in one way or another. A fairer and better Scotland is still to be won.